Grey Matter Art and StudioCanal present a New Limited Edition, Screen Print by artist, Grzegorz Domaradzki (Gabz) for the iconic film “Escape From New York”. This will be the first official poster for the John Carpenter classic released in 1981, featuring Kurt Russell as hero “Snake” Plissken. 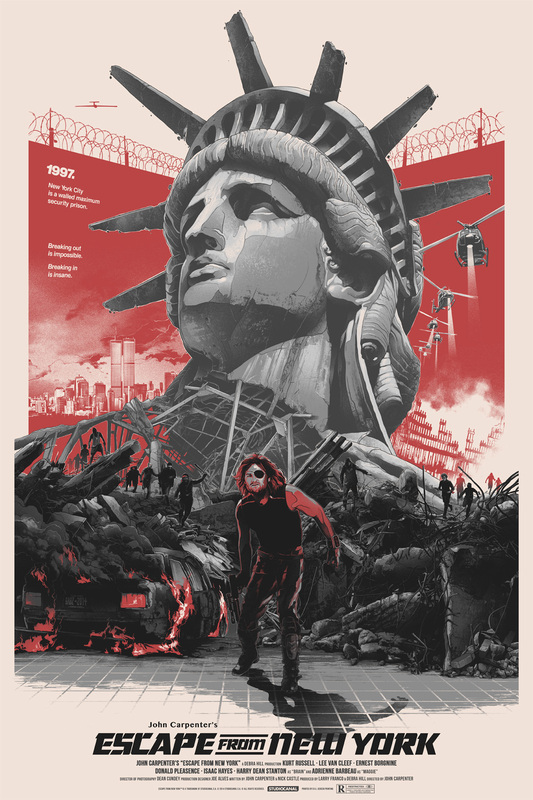 Also, this will be Grey Matter Art’s second offering and first collaboration with Gabz, who said this about the project, “When Mike Gregory, co-founder of Grey Matter Art offered me an opportunity to work on John Carpenter’s “Escape from New York,” I didn’t hesitate much. My main intention was to deliver something a little bit different from what I’ve been known for until now… something less character based, more focused on the movie’s atmosphere, and true to the original poster artwork. Being a fan of the original and iconic poster, my print also has post-apocalyptic streets of New York City, gang members, and the majestic Statue of Liberty (or what was left from it) dominating the skyline. Except Snake Plissken, in my version is all by himself: tired, hurt, on the run, and fighting against all odds. Perceptive viewers should also notice Snake’s plane crossing the red walls of the New York City prison, and the bottom grid which is intended to be a tribute to visual effects used in the movie”. Posters will go on sale Wednesday, April 30th at a random time between 1:00-2:00 PM. EST on their website’s shop page. Wait for the tweet to be notified on when this poster will drop.